Here are some of the tools we use and recommend for working on stage and in production. Stage Plot Pro – If you’re a band performing on a stage you’re going to need to submit a stage plot. Here’s an easy way to do it. Audio Tools – We have this on our phones and tablets to measure and track what’s happening with our sound systems. M-Air iPad app – iPad app to control our small digital mixers with. If you’re renting one from us, you’ll want to have this on your tablet. Tracks Live – Free multitrack recording for Mac and Windows. Sessions will import directly to ProTools. We use it for lots of stuff. Sun Surveyor – Phone app to see where the sun is going to be in the sky. You’ll want this for outdoor gigs or for setting up shade structures or for figuring out what direction to park your vehicle when you’re camping. NOAA Weather radar – Great for knowing when something bad is headed your way. For a good time call us at. . .
We are based in Joshua Tree, California. We provide services in Southern California and beyond. 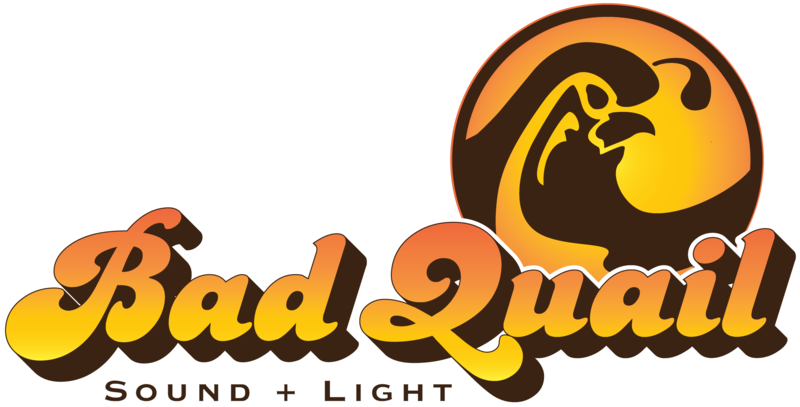 Bad Quail provides professional event production services in the high desert of Southern California and pro audio sales across the nation.